I shouldnt have been surprised to learn that Ben, whose photographs always include people, didnt have the patience to wait for Nick and I to do our landscape photographer thing. As long as the hike or the scene would be epic we might capture his interest long enough not to make us pack up and head somewhere else. We hiked The Narrows. We walked the Vegas strip. We explored eroded landscapes and salt flats in Death Valley. And on the last night we showed him the Milky Way for the first time with his naked eye. The drive from Vegas to the Bay Area is long. 10 hours long. I decided we should break it up by spending the night in Bishop. 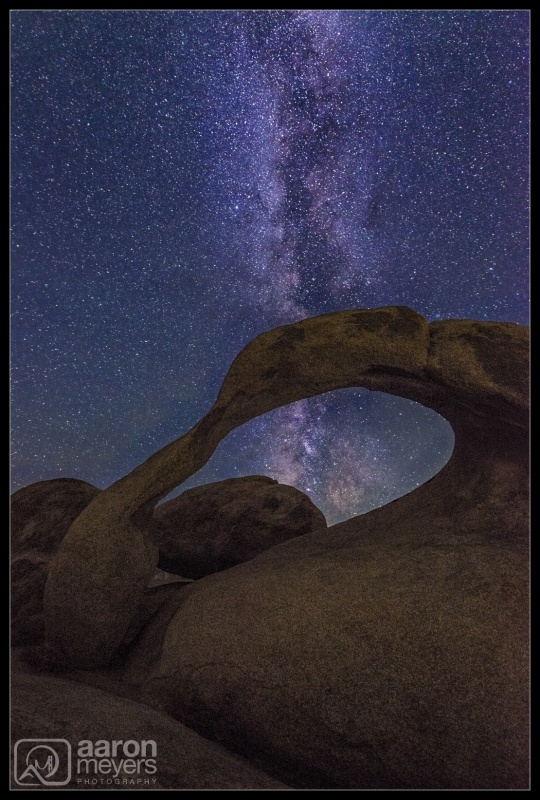 As soon as Ben saw a photo of Mobius Arch he screamed were going there So after Death Valley we made our way to Lone Pine and the Alabama Hills. We arrived at Mobius Arch just after sunset and figured out where it was and what time the Milky Way would line up behind it. Midnight to 3am meant that we grabbed some pizza, a nap, and then waited. Ben and Anna created a selfie-series photo. I snuck in a few photos of them posing under the arch. And when they left, I captured this one.